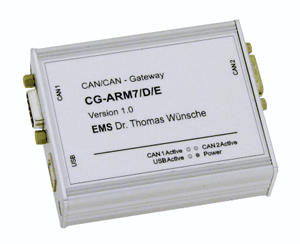 The CG-ARM7/D/E is a CAN Bus Gateway designed for applications where there is a demand for higher flexibility. Both the supply voltage range and the operating temperature range are extended in a way that the use in automotive applications is possible. The CG-ARM7/D/E obtains its potential through the use of a 32 bit micro controller with 48MHz clock. High speed processing and low latencies allow the use with high data rates and bus loads. A benefit of using a CG-ARM7 CAN Gateway is that the restriction of the maximum data rate depending on cable length for single CAN segments can be abolished for the over-all CAN system. The connection of the CAN bus is done by a D-Sub 9 male and female plug. These are also used as default power supply connection. An USB interface is provided for configuration, firmware download and optional power supply purposes. Any (also temporary) stress in excess of the limiting values may cause permanent damage on CG-ARM7/D/E and other connected devices. Exposure to limiting conditions for extended periods may affect the reliability and shorten the life cycle of the device.